Earn $4.72 in Rewards credit (472 points) What's This? When it's you against the clock, or you against the entire pack of riders trying to quash your bid for victory, the Vittoria Corsa Speed Tubular will keep egging you on so you cross the finish line first. It harnesses every performance advantage of its G+ Isotech® graphene rubber compound and strips away anything that doesn't help it be lighter, faster, and more aerodynamic. This race-only tubular is designed for courses where punctures are unlikely and speed is everything. Its profile is optimized to fit on modern wide aero rims to make use of every advantage possible. 700 x 23 mm. Claimed weight is 220 g. 320 TPI casing. Compatible with tubular rims only. Will not work on standard clincher wheels. So far so good as a fast track tire! Nothing I don't like as a track tire. Bit it is a minimalist tire and I would be weary of using it as anything but a front tt tire on (clean) roads. I have been using it on my carbon front wheel at the Stub Hub Center indoor velodrome in Carson, California. 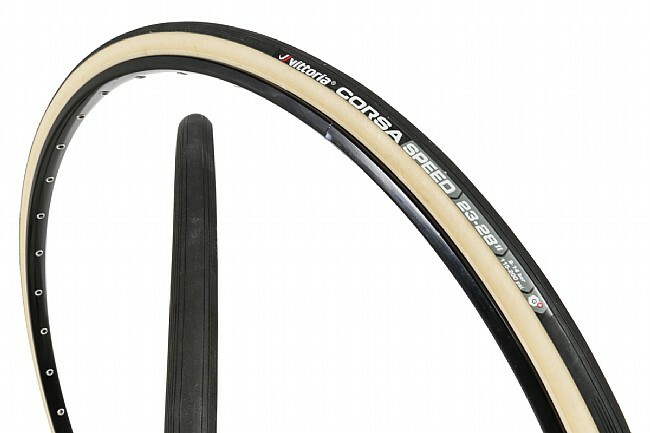 After I wear out the Conti 4000 S2 on my disc rear ( may take awhile as it is much more substantialI also use the disc for road tt) I will mount the Corsa Speed on that wheel too, and use it only on the track.